The Center for Violence Prevention is one of the sponsors of the It's on Us campaign to prevent sexual assault at UNI. The Center for Violence Prevention offers training sessions for Mentors in Violence Prevention. The Center for Violence Prevention graciously welcomes Officer Martin Permen to the University of Northern Iowa. 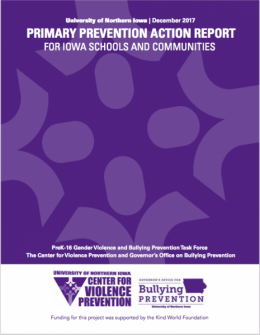 Primary Prevention Action Report for Iowa Schools and Communities. 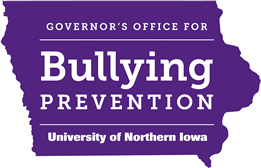 On Sept. 28, 2015, Governor Brandstad, established the Governor’s Office on Bullying Prevention in affiliation with University of Northern Iowa’s Center for Violence Prevention. The full text of Executive Order 86 can be found here. "We are honored to host this new prevention initiative and appreciate the governor recognizing the center's work and impact across the state," said center director, Dr. Alan Heisterkamp. Founded in 2011, the Center for Violence Prevention, in partnership with community service providers and with public/private foundation support, has trained and facilitated the Mentors in Violence Prevention (MVP) model and bystander education program to more than 50 secondary schools and colleges in Iowa. The Center for Violence Prevention and the Governor’s Office on Bullying Prevention together will provide a unique PreK-16 systemic approach to training and program implementation that supports bullying and gender-based violence prevention efforts across the state. Contact us.